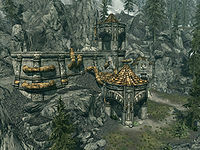 Mzulft is a Dwarven ruin located in Eastmarch, far north of Riften. During the time of the Dwemer, Mzulft was a major city. It was built as a vast dedicated manufacturing site, considered vital by the Dwemer. It was home to a storage site for raw Aetherium, which was kept outside due to the substance being harmonically volatile. The settlement also had a mountaintop Oculory, as well as soul gems used to preserve memories. The complex extended deep into the Velothi Mountains, with a surface entrance at Skuldafn far to the east. Led by Arkngthamz, Mzulft was one of the four Dwarven city-states that allied in the early First Era in order to research Aetherium. The alliance shattered once the substance's true power was discovered, and Mzulft fell to the Nords led by King Gellir, who attacked the Dwemer holdings while they fought among themselves. The settlement was reclaimed by the Dwemer a century later, only to be left abandoned after the race's disappearance in 1E 700.